Growing up in Upstate NY, I found myself searching out accessible water to direct my growing passion for fly fishing to in the nearby regions. I fell in love with the Ausable River (Adirondack Mountains) and frequented a small shop located in the vicinity. 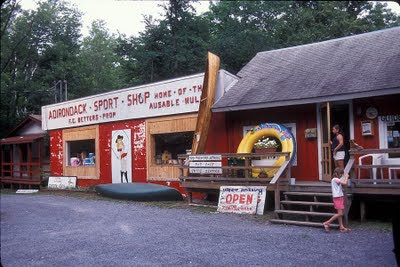 That shop was the Adirondack Sport Shop and the owner's name was Fran Betters. Fran Betters was an early influence on my fly fishing and fly tying development. I remember being intrigued by his Ausable Wulff fly pattern because the red head seemed to defy all the rules. I bought a couple of his books and then eventually a 7'6" 4-5wt rod that he built because it was considered his favorite (shown below). Sadly, Fran died this past Sunday but his influence will live on. You can read additional posts at MidCurrent, Tippetsandleader's and the fly line. You can hear a podcast about Fly Fishing the Adirondack Range that Fran did on Fly Fish Radio back in 2006. Godspeed Francis. That is what it's all about. What a blessing it is to have good mentors in this world of ours? A blessing indeed Andrew. I've been pondering the idea of doing a post about the topic (mentor). We'll see. Thanks for the comment. I appreciate you posting the piece on Fran Betters passing. I know he'd been a mentor to you since early in your life. For me he became one in the mid 90's when I moved to VT. I'd rarely fish the West Branch without stopping by to say hi, cast a rod, buy some flies or get the latest info from Fran - I loved his entrepreneurial spirit and outright positive attitude - hard to comprehend considering all he'd been through in life. I love to tie flies almost as much as much as I love to fish and rummaging through the fly trays at The Adirondack Sports Shop was always an exciting experience. I loved his ability to distill the essential and produce simple effective flies that had a fresh twist, my visit to the West Branch this weekend will be a sad experience. I'm well stocked with Fran tied Ausable Bombers and if I happen to lose one in a big brown I'll actually be happy. I am saddened to learn of Fran's passing. Back in the 1970's, I spent severals days each week during the fly season at Fran's shop or fishing the river. We had some great times together. He had a remarkable gift for innovation of all kinds. I particularly liked how he could make up a simple poem almost at will and very quickly. He had a collection of old-time flyfishers who came into his shop regularly, many of whom had been customers and friends for years. Warner Wales, Ed Knapp, Jack Smith, Bill Rawls,Bill Phillips and Clyde Ames are just some of the names which I still remember from those days. Few of them are still living today. They all were mentors but Fran was the keystone which held them all together in my experience. I was just beginning to fly fish in streams and learned from many of them as well as Fran. It was Fran who made it all possible because he was the one who introduced us. Although I had'nt seen much of Fran in recent years, I've always regarded him as a real friend and shall miss his presence in Wilmington. He was my "go to" guy on the West Branch. Farewell old friend. I did not know Fran, but sounds like he moved on to eternal waters with many smiles, warm memories and great generosity in his path. Those with his thread in their life shall always have him within their cloth. Thanks for sharing El Pescador. I was with you that day you bought the rod from Fran. That trip to the West branch of the Ausable was my introduction to fly fishing. Although that was the first and only time I ever met Fran Betters he was someone I never forgot. Thoughtful comments everyone. It certainly sounds like John is right, Fran's thread has been sewn into our collective and individual cloth. Keep your lines in the water and believe in every cast....oh and Anon, I bought that rod so long ago that my memory of that particular day and who I was with fails me, who are you? He was a true original, and an eternal optimist.....I got my first fly rod at his shop(a Green River). He always had a greta twinkle in his eye and a story to match. I can attest to his love affair w/ the Ausable...while there are fishier rivers to visit- there are none as beautiful......I am lucky enough to live here, and had the opportunity to do some guiding for Fran a few years back........Remember- "You gotta skitter it." I am your sisters 'old ball and chain'. I remember the trip like it was yesterday even though it was over 20 years ago. We should make it back up there with the familys some day. Great comment RFinn. It made me remember a special moment on the river when I tossed a Variant dry over a current line onto a glassy eddy. The current grabbed the line and caused my fly to skitter across the film and a trout came up and grabbed it. Fran's words ("You gotta skitter it") rang true in that instant. Thanks for the clarification BT. I figured it could only have been one of three guys but with no name attached it was only a guess on my part. Let's plan something in the future so our boys will experience the Ausable together. Nice memorial today at monument falls on the Ausable for Fran Betters.....well attended .and a nice job done by the chaplain from the hospice who spent some time w/ Fran toward the end. Some music, some poetry and they put some of his ashes in the river....... This evening, another trubute is taking place at 20 Main in Ausable Forks......killer music jam w/ one of Fran's dearest friends TJ Swan....Fran woulda loved it! Thanks for sharing RFinn. It's nice to know that Fran's essence has been mixed with the river. Let me know if any of the poets would be interested in sharing their words with the Way Upstream community. If there are any links to pictures from the event then share those too. Enjoy the Fall in the Adirondacks and catch a nice landlock for me.